We were able to watch and recap this one yesterday evening, but didn’t get a chance to post until today. We just found out that today’s episode is postponed due to soccer. I know, I know, this show just can’t catch a break with its airing times. When I was joking about dropping this show if it got postponed again, I didn’t really think it would get postponed again, goodness. Also, the week after next is Korean New years Day (Lunar New Years) so this show could get postponed again. Recap Countdown: This is posted as a quickcap…Check twitter for updates! Osol tells Sungyeol, okay, I won’t go anywhere. He leans in and kisses her. Then, with a tear on his cheek, he tells her not to go anywhere, you promised me. She agrees, she will not go anywhere. They kiss again and this time it is a lot longer. She wraps her arms around is neck and they keep kissing. Later, Osol waits outside the bathroom as if super bored and then leans over and asks through the door if he is done taking a shower? how long do I have to be here? He tells her through that door that he is almost done, but it has taken him like 2 hours to take a shower and clean up. he tells her not to go anywhere, stay next to me. So she keeps waiting there on the floor. But then something rings so she has to run to the door or somewhere. Sungyeol calls her name again, but she is gone. He finally comes out and asks here where she was? She says that she went to the washing machine to put the clothing in the dryer. He tells her to just stay there, waiting outside the door. She says okay and keeps waiting outside the bathroom as he waits and calls her name every 10 seconds. Osol calls Choi to talk about things and why he left early yesterday. CHoi said that SG might think is was weird for him to be there. I told your father what was happening so they aren’t worried. Take care of Sungyeol and then call me. He gets off the phone then looks through a cafe window at Gwon. She looks deep in thought. Osol sits at the table with Sungyeol while he is about to eat. He says he does not have the strength to feed himself and gives her a look as if he wants her to feed him. So she does, but in doing so she also sits on his lap and they kiss again. The vacuum interrupts them so he tells the vacuum to find another time to come. Osol sits back in her seat and helps SG eat his food. 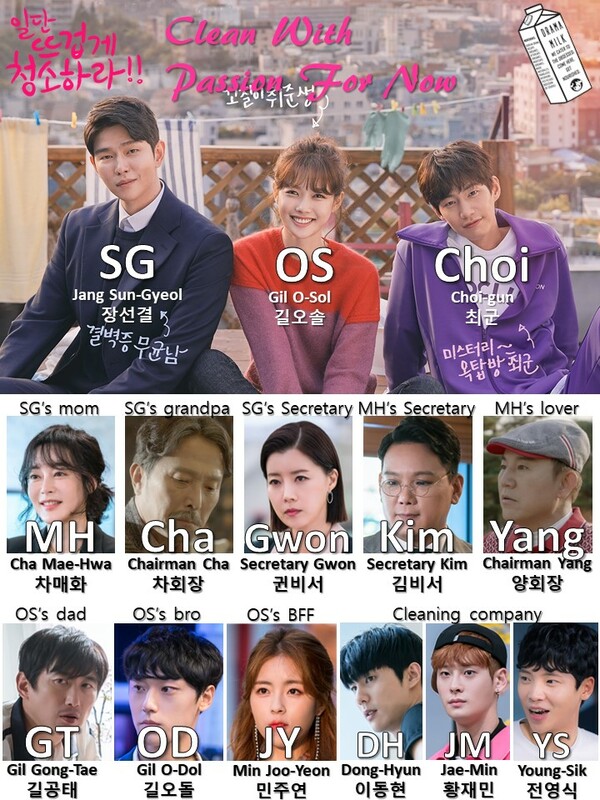 OS – But, why is the vacuums name Geum-ja? Does it have a story? SG – It is the name of the nanny that raised me. Kim Geum-ja. And that was my nanny’s last gift to me. She died 5 years ago. OS – You had a good relationship with her? SG – Yes, she raised me instead of my mom. I threw away all the old things. The vacuum is the only thing that reminds me of her. OS – That is why you looked for it so much. It is important to you. OS – Why do you like me so much? SG – What do you mean? SG – Do you remember what you said when you first came to my place? You said there was a reason why I behave this way? Flashback to when she first came to the house. SG – You did not yell at me because I was too clean. You thought I had my own reasons for that. OS – Did I? *smiles* Yeah, I am good at sympathizing with others. He smiles pleasantly at her. Meanwhile, Gwon mentions the accident to Choi and asks him if he knew everything. He tells her that he is more surprised that she did not know. He thought that she was close to Chairman Cha. Does he know that Osol’s mother was the victim of the accident? Gwon says no, they don’t know. But what should they do? If they know about it then they will get hurt. Back to SG and Osol. Osol is about to head out. Sungyeol asks her where she is going, lets go together. Osol says that she is going outside, she can go alone since he should rest. But he really wants to go with her so he tell her to wait and he hurries and changes his clothing. Cut to them driving, he tells her that she should have said that she is going to see her mother, he would have worn better clothing. He is happy to drive her there and wants to say he to Omonim. it is a moment, but then a kid follows his ball intot he street so they have to swerve to miss him and hit a bunch of trash. The kid is okay so they are very relieved. But there is a lot of trash on his car. Osol wonders if she should call secretary Gwon? he says no since it is his off day. They end up taking a taxi the rest of the way, but SG has to spray his disinfectant all over the car. He also has his handy handkerchief to put on the seat. They end up riding together in the taxi while holding hands. But SG passes out when he finds out that the taxi driver cleans his seats with a mop. They get dropped off at the bus station. Osol tells him that she is okay going by herself. Just call Gwon, it should be okay. The bus comes so she hurries off. But SG follows her and gives a pretty big bill for riding the bus. He gets the change all back in coins. Cut to them riding together in the bus. SG does not want to touch anything. He doesn’t want to hold the rail or sit or anything. He just sticks closely to Osol. He tells her that this is not that bad of a moment in the bus as his first time. But then a lot of ajummas come in talking and chattering about at the cute couple. Osol thinks they should get out right away, so they do. Osol thinks she can walk the rest of the way. So she takes off walking. They end up walking slowly along the ocean. She is a little quiet. He starts freaking out about a bug, Osol picks it off and says that it is not a bug. She also tells him that bugs are not dirty. She starts to laugh that he is afraid of bugs and then holds his hand as they continue walking and she keeps teasing him. They finally get to Osol’s mothers resting place for her ashes. SG greets her pleasantly and then says that he will go outside now. he thinks she should have a lot to talk to her mother about. Take your time, don’t worry about me. So Osol takes her time and hangs out with her mother. OS – Mom, how were you? He is handsome right? He is the one that I love. He is tall and has a good personality. If you saw him in person then you would like him more. You know everything. You see everything from there. When I think about Odol, I shouldn’t have done this. I shouldn’t keep doing this. What should I do mom? What should I do? Later on, SG an Osol talk outside. SG – Me? Maybe not. OS – Your face, in the beginning you both look cold, but then you look charming and cute after getting to know you more. SG – So my mother is like that? OS – DOn’t be too angry with her, she did it for you. SG – I am not saying anything, because of her, we are together like this. Mom and halabogi were the same ever since i was little. They always ignored my will and behaved. I really hated those things ever since I was little. But it does not fix my germaphobia or change anything. OS – I am sorry. SG – You shouldn’t be. Let’s not talk about this, let’s talk about us. Wow, waiting for the bus somewhere like this….I have a lot of firsts with you. They smile and holds hands while sitting on the bench and looking at the sea. But Osol starts to think about something that might bother her. Much later on, Osol lays awake in her bed and looks at her cactus suitcase. Sungyeol gets to work in a very happy mood. He greets everyone and critiques how they should be cleaning in a pleasant way. Elsewhere, Osol is in a serious mood as she meets Gwon in a cafe. She tells Gwon that she does not think that she will be able to fix his germaphobia and she does not want to lie to him anymore. Actually, when she saw the grandfather, she promised him that she should not date he CEO ever. Gwon asks, the chairman asked you that much? Osol says that she understood him but wasn’t able to keep that promise. Gwon tells her that she knew the CEO liked her and hoped it worked out with her brother. Osol smiles and says that she will find another way. Osol gets back to Sungyeol’s place. Or maybe she is heading out? he asks if she is going somewhere. She says that she is thankful for the time there, Gwon will find another person to help around the house. SG asks if she is quitting now and what happened. Osol says that nothing happened, she wants to start over with him from the beginning. He asks what about the problem that she had where she had to stay at his place. Osol says that she is actually leaving to solve that problem. When I figure everything out, I will call you again. Just wait until that point. SG wonders why this is so all of a sudden. Osol apologizes and says that leaving this place does not mean that anything is changing between the two of them. Gwon sits with the Grandfather and asks a question. Gill Osol, why did you put that condition to not date there? Grandfather asks if she told her that? My Sungyeol will be the heir of AG group, they are not a good match. Gwon says that Osol will quit. Grandfather tells her okay and then brings up the brother. Find some people to put on the board about his disciplinary meeting. Gwon asks if he has to do this? It does not seem like it is for the CEO. Grandfather says that he does not have time to wrap up the heir thing, he has to do anything to cure his disease. Gwon looks concerned. Meanwhile, Osol comes home with her suitcase. Her father and brother wonder if she is fired? That jashik said that he needed you but fired you? That jashik. She says that she quit, do I have to get fired all the time? Gwon comes in and asks if she is fired as well. Osol is all like, what is this? They all try to play it off. The four of them have dinner together. Appa tells her not to worry about anything and to just eat. They eat happily, Osol is so happy to eat at home and to eat meat again. She says that the butcher is really good and smiles. After dinner, she sits with Odol in her room and apologizes for not being able to help him. She will try and figure out how to solve it. He says that she does not have to apologize to him, he was happy that she went to Busan. He would not have liked it if she stayed and thought about his problem all day. It was good to quit the job now. You can do what you really want, don’t sacrifice anymore. That is what father and I really want for you. The next day, Osol heads out and runs into Choi. He asks what she is doing. Osol says that she should try and do anything before the disciplinary act starts. He tells her good job. Getting out of that house was a good choice. She agrees but is sorry to think about Odol. Choi explains that Odol does not want that kind of help, so don’t think about it. Meanwhile. Sungyeol imagines that Osol is giving him coffee at home. She smiles at him happily and he smiles back. But then she disappears. He ends up calling her at work and asks if she is okay. She answers but she has to go somewhere and hangs up quickly. Gwon comes in and asks if he is okay. He says that liking someone is lonely….My friend started dating, he is lonelier than before. At the same time, Osol talks to Odols coach. They tried to do all that they can do from the schools side. If there were witnesses then they could solve it, but there weren’t any (but I think there were several witnesses there?). Osol understands and leaves. Elsewhere, Jaemin and Youngsik talk to Odol on the phone about how Osol is working hard on the disciplinary case. They will check on who will be in the committee. They think that she should have told them what was happening. Sungyeol overhears and asks them about the disciplinary hearing and Osols brother. Outside, Osol tries to hand out flyers to see if there were witnesses about the situation in the parking lot. SG approaches her and asks if the problem that they could not tell him about was this? I am a little disappointed. But then the other guys come out with a lot of roses to help hand out the flyers. Sungyeol asks them if they are all ready to start. They exuberantly say yes and start handing out everything to look for witnesses. SG tells her that he used this flower method when he started this. It is the best way to warm peoples heart. Osol smiles and looks at him warmly, he looks at her in the same way. Then they both watch the cleaning team passing out the hearts and flyers. Gwon is in the background watching from her car. it looks like she is watching secretly. She thinks deeply and looks at a USB. It looks like the chairman might have been the one to remove the CCTV footage. After handing out the flyers, they can’t believe that no one saw anything. However they are pretty playful about it. jaemin gives Osol a friendly hug. Sungyeol is all like, um what are you doing? Don’t you know about the Me Too movement? This can be about that you know. They all wonder why he is so into Osols life? SG says that she is a former employee so he still cares. The cleaning team is all like, okaaaaay. They all leave amicably. Osol stays with SG and tells her that she should stay around a bit longer. He wanted to see her. She tells him to come a little closer to her. he comes pretty close. She tells him to come closer. he comes closer so she sinks into his jacket for a big warm hug. he thinks people are watching. She doesn’t mind and tells him that all her stress dissolves when they are together like this. He takes his hands from his pocket and embraces her. he tells her that her brothers situation will go well, don’t worry about it. They looks at each other and smile, then hug once more. Later on, they both walk home. SG tells her that her situation should be difficult with her quitting and her brother situation. That must be why you did not want to date? She says that it is not only that. He asks if there is something else that he does not know about? Osol is about to tell him but then she gets a call from Joo-yeon who is very happy with her family and tells Osol that Odols situation is all taken care of. Osol runs home. Appa is onthe phone talking about the CCTV and how it is all taken care of. Choi says that the doctor found it, someone left it in front of the house. They are all super happy that everything went well, lets watch soccer! But then Appa turns around and sees SG standing there. Cut to SG sitting at a table with appa as he dribbles his drink back into his cup. Appa asks, soooo….you guys…. SG immediately asks for appa to give his daughter to him! Osol his him. So SG lightens the ask a bit and says that he wants to date Osol. Appa is all like, is that it? Lets eat and leave…..(switches to banmal)…..lets eat! Son-in-law jang! he gets up to head to the kitchen. SG is happy and Osol is a bit happy. Choi is not happy at all. Sungyeol greets Odol and looks at Choi in a annoyed way. Choi tells him there is a bug so Sungyeol is about to freak out. But then he says he is joking and smiles. Appa comes back with all the food. They all eat and drink from the same bowl and cups. SG has a hard time drinking alcohol from appas cup. he tries, poor thing, so Osol saves him and says that SG has to drive. Appa then picks a lot of chicken with his fingers and tries to give it to SG. Osol says that SG has a chicken allergy. Appa is all like, ohhhhh….yeah, you shouldn’t eat this. But then Choi grabs it and says that he will eat it, anyone can eat it right? Appa tells Choi that he likes how he eats. Choi licks his fingers and looks at SG. Osol mentions the CCTV and wonders who put it there and how do they know that it was our hour? No one knows. After eating, Everyone walks Sungyeol out. They have a bit of playful banter about whether Choi knows SG from before. he says no and laughs. Another playful banter about how Choi shuod be a doctor. Choi laughs. Everyone heads out. Odol tells Choi that he is on his side, he knows things. Loyalty is important for men. That makes Choi happy. Osol and SG walks away hand in hand. SG mentions that he is happy her brothers situation is solved. He asks her, since everything is solved, do you want to go to my place and eat ramen (can also mean, “sleep together”) she is all like, eat ramen….maybe next time. They are waiting for me. See you next time, Oppa. he is happy to be called oppa. She is all like, you know, you are older than me. He happily says yes, he is and plays with her hand a little bit, Then he tells her goodbye and starts to walk away. SG – Oppa is leaving….bye bye….Oppa….is leaving…..
Osol giggles and waves goodbye. Then she smiles and watches him get to his car and head off. Odol and Youngsik talk about how YS said everything would go okay. You know, my long long long distance cousin knows committee members and your thing was not that big deal at all. They keep walking and smiling. But then Odol sees Jooyeon on a date with a man. He goes inside and stares at them from a distance. She coughs. Cut to him pulling her out. he tells her to stop going on blind dates, that is why you have all those bad guys around now. She tells him that he does not know anything. He is at a big company and has a house in his name. Odol yells her name. She tells him that she will kill him for saying her name. He tells her that she is his from today! When I have a gld at the olympics I will get commercials and can date! I am serious! Here, I give you my oath on the Korean national flag. If I win the National team competition, I will confess to you first! he leaves with determination and salutes her as he walks away. Cut to the mother and Osol meeting happily over coffee or tea. Umma says that she head that Osol left her sons house, she does not think that she should have done it. Osol says that she is dating now and it is all because of her. If possible, can I call you omonim? Maehwa is all like, Omonim??? OS – My Oppa is off soon, so I will visit you with Oppa soon. Thank you for the coffee. Osol heads out. Maehwa is so happy to think that Osol is calling her son Oppa and asked to call her Omonim that she giggles and claps. In the office, SG comes clean and tells Gwon that he is that guy that started dating, there was no friend in Minnesota. Gwon smiles and says that she knew. But she has to excuse herself to take care of something. She heads out. SG gets a text right at that time that Osol is there. Cut to Osol and SG telling the cleaning team that they are dating. The team is shocked, of course. But they congratulate them and says that they area good couple. Osol and SG happily leave and wonder what they should do now, go on a date? Go to the Han river park? Maybe not? SG gets up his courage and says, yes! I can go to Han River par! I took a bus! And a taxi! So I can go to the park! So they head to the park and walk along the promenade. Osol worries about him a bit with all the people and dogs walking around. SG even hides behind her a few times to avoid people. She asks if he would like to go home but he says that they can stay. They keep walking. Osol tells him that she would like to eat Ramen in his house, can you make me ramen? She smiles and firecrackers go off, behind his head. Cut to them at his house, he presents her with a dish of ramen and tells her to eat up. Then he apologizes and says that he is sorry he could not stay at the park. Osol makes it seem like it is not a big deal. Let’s watch a movie together. I always wanted to watch a movie with my boyfriend. On the TV….at home….She smiles. So they start to watch the TV and hold hands. On the TV, the couple kisses. It makes them uncomfortable and awkward. He cleans something from her face for a moment which is a bit shocking as well. he tells her that her room is empty and tries to hold her hand again. They are both super awkward. He apologizes and says that he didn’t think. She gets up and says that she will leave. he says he can drop her off. She runs out and says that it is okay. She runs out the front door and takes a breath. But wonders if she should say goodbye? Or maybe I should just leave? She turns to knock but then he opens the door at the same time. SG – Oh, you didn’t leave? OS – I will sleep here tonight. She leans in and gives him a very quick kiss. He leans in and gives her a very deep kiss. They end up happily kissing all around the apartment. Okay, that kiss in the beginning looked so uncomfortable to me and that kiss at the end was kind of awkwardly long. It was strange. But it might just be my own issues with their age differences showing. JY – There is an old saying, the quiet cat goes to the kitchen first. VO – Why is that guy, why is he the family that Killed your mom! Cha – You have my life, what do you want? SG – I will do it.